The Vermont Folklife Center has received funding for two new projects on Franco-American music in Vermont! One focuses on the VFC archives with the goal of developing a simplified approach to describing archival collections of French language songs from Canada. The second also draws on the VFC Archives, but emphasizes bringing these materials to the public through a series of Franco-American “singing schools” for young people to be held in Fall 2018 in partnership with Young Tradition Vermont. The late Franco-American singer and cultural advocate, Martha Pellerin in performance. With nearly a quarter of Vermonters (22.3%) of French-Canadian descent, the cultural heritage of Franco-Americans is undeniably a fundamental element of Vermont’s contemporary identity and culture. 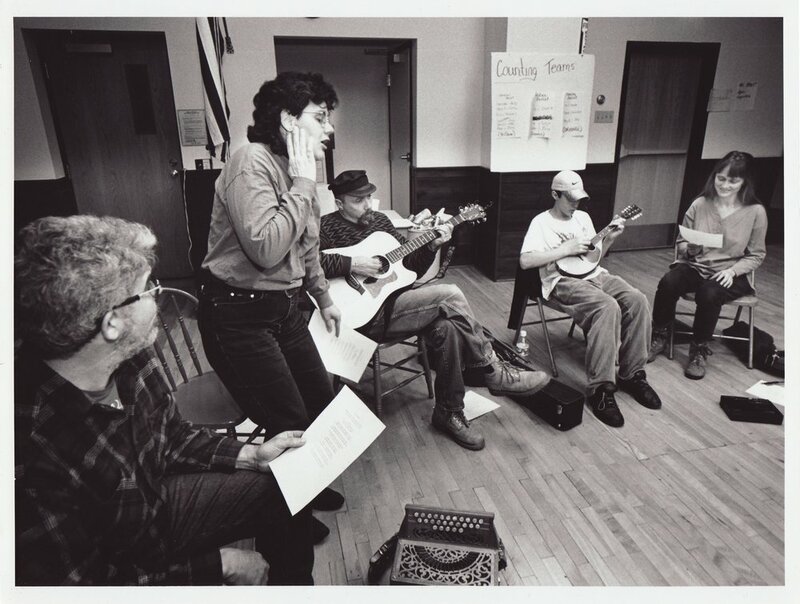 However, despite the deep integration of the cultural perspectives of Franco-Americans into the everyday life of Vermont, the inaccessibility of the French language often presents barriers—including for many Franco-Americans—to wider engagement with one of the richest aspects of Franco-American culture: song. Through these two projects we hope to move beyond this perceived barrier and promote and present Franco-American song as a vital cultural asset for all Vermonters. Song book manuscript from the Beaudoin Family Collection, Vermont Folklife Center Archive. With support from the American Folklore Society’s Technical Assistance and Consultancy Program, VFC will work with archivist, folklorist and renowned French Canadian fiddler Lisa Ornstein to develop a model for cataloging collections of Franco-American song held in archives. Using the VFC’s holdings of Franco-American songs as a test case, Ornstein and VFC Director of Archives and Research, Andy Kolovos , will create a detailed set of guidelines to aid archivists in making these materials more easily accessible to performers, scholars, culture bearers and the general public. “Franco-Americans brought to Vermont a rich heritage of traditional French-language song and a tradition of call-and-response singing which celebrates the joy of making music together,” says Ornstein. Sisters Carmen Beaudoin Bombardier and Nina Beaudoin performing. Thanks to a 2018 Champlain Valley National Heritage Partnership grant, VFC will partner with Young Tradition Vermont, musician and scholar Lisa Ornstein, and Franco-American singers Carmen Beaudoin Bombardier and Kim Chase to identify and select a group of songs from the VFC Archive. Based on this work the team will then host a series of Franco-American "singing schools" for Vermont young people in fall of 2018. The project will also generate a teaching curriculum, song book and website. These resources will serve as a springboard for developing ongoing programming to revitalize the sharing of French language song in the state. The project will culminate in a performance during Young Tradition Vermont’s Young Tradition Weekend in the spring of 2019.